Down the Lane • View topic - Getting carried away!! I have 5 crochet projects currently on the go!! Not quite sure what happened there, but I have little baskets all over the place! The first is a cushion for a friend's birthday, but I will find it very hard to part with when it is done! I have bought her presents before and I liked them so much she never got them! The second is an african flower something. Not sure what yet! I would like it to be a blanket, but it is quite time consuming and also, when it is assembled, it has wiggly edges, which I dont like, so I have been experimenting with half hexagons, which are a little tricky too. I have made 9½ so far, and if I want a blanket I will need at least 140 - 160 so am thinking perhaps another cushion, or something....cant decide! I dont want them just left as a few I made as an experiment! The third is some easter heart bunting I started last year, but despite spending a fortune on two deliveries of wool this month, I seem to have run out of a yellow I need! and the fourth is some flower bunting. The final one is my new blanket. 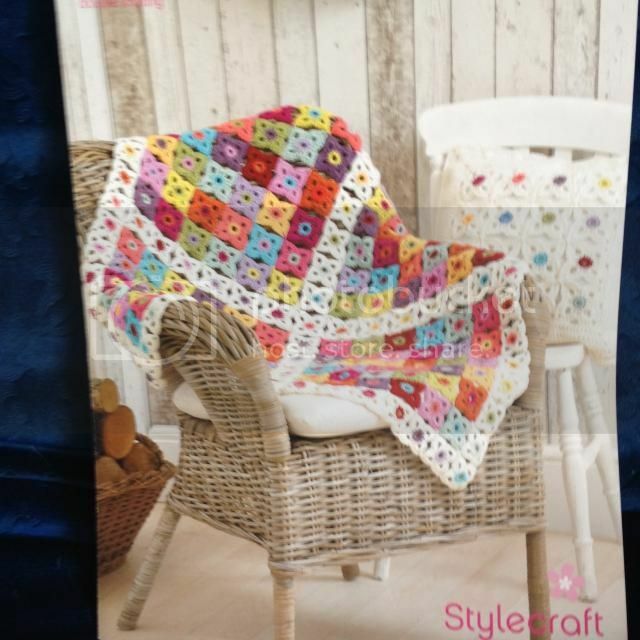 I actually bought this pattern for it this week, and am pleased I did as it is very pretty. Although it is coming on already, it will take me a little while to complete, but will be worth it. I think I have got completely carried away It may have something to do with my most recent creation, a cushion, which makes my heart soar every time I see it!! I still can't believe I actually made it! What about using your african flowers for a hat? They would look lovely covering the top and sides of one. You might need to hide that cushion when I come to visit or it may end up being sneaked into my car! They are so beautiful, I would want to keep them all as well. So clever Helen. My blanket is doing ok, it is a 'join as you go' one, which to be honest, I haven't done before and I am not sure about. Less time consuming than sewing together at the end, but I don't like the end result as much - not invisible and floppier. Mind you, I think it's the only option with this design. I do love working with bright colours, and find them very therapeutic. Actually, I find crochet altogether relaxing and rewarding. So glad I took it up and persevered! Wow, Helen. The colours are stunning. Most envious. I haven't quite finished the one for my friend yet, but I have a month left to complete it before her birthday. It's very different from mine, as I have tried to account for her taste. Such lovely work. I really can't believe how proficient you have become in such a short time.